One of the principle tasks of a lawyer is research…lots of it! Even the most well-staffed law firm may find itself occasionally (continuously?) overwhelmed by the amount of work that needs to be done in finding the best case law, conducting due diligence, untangling an intellectual property dispute, or looking for that prior art that you just know is out there, somewhere. Lawyers can certainly hire a consulting service to assist them when its crunch time, but that takes a lot of effort to arrange, and a substantial budget to pull off. Where to turn, when you need some fast, quality research assistance that won’t break the bank? Google Answers is as obscure as Google itself is famous. But it is a terrific service, especially for a lawyer in need of adjunct research talent. For a very modest fee, a team of Google Answers researchers stands ready 24/7 to provide high-quality, fast-turn-around work with almost no administrative hassle. Google has on contract a team of several hundred carefully-screened expert researchers. All of them are highly-skilled at using Google to mine the web, and uncover those little needles of information in the cyber-haystack that is the internet. But beyond simple Google searches, many of the researchers have access to other sources of information familiar to any law firm — Lexis-Nexis, Factiva, PACER, UCC records, and so on. If you need the services of a researcher, you simply post your question to Google Answers, and set a fee. Whichever researcher feels that he or she can answer the question — and also feels that the price offered is fair! — will ‘lock’ the question and get to work on it. For a well-focused, attractively-priced question, you will often have an answer back in just a day or two, or in mere hours if you need it faster. If a question needs some clarification, you and the researcher can engage in an online dialogue to pinpoint your needs more precisely. Researcher provided a detailed competitor-analysis that covered corporate identity, management, safety record, litigation, project awards, customer base, environmental issues, etc. Google Answers provided documented examples of “electronic S&H stamps” prior to a specified date. Question about marital property in Virginia Research offered statute and case law pertaining to status of marital and separate property in the state of Virginia. An answer provided legal precedents in Canada for what constitutes a professional conflict of interest for architects. Someone wants to know: What would happen to a lawyer in California who was arrested for using drugs? There are Q&A’s at Google Answers that pertain to just about any area of law you can name. The site’s search function will let you easily explore other questions that may be of particular interest. Google Answers can be an exceptionally valuable resource for the legal community. A key asset is its ease of use. It takes only minutes (and a credit card) to set up an account with Google. Simply click on the “Create a Google Account” link on the main Google Answers page to get started. –Everything posted at Google Answers is anonymous (you are identified only by a user name of your choice). At the same time, everything posted is publicly viewable. There is no option for direct, private communication between a lawyer and a researcher. –Google Answers researchers will not provide information on living, private individuals. If you’re trying to track down the current address of a client’s long-lost sister, Google Answers is NOT the service for you. –Google Answers cannot provide full copies of copyrighted materials, though they can certainly provide excerpts, full citations, or direct you to links for relevant materials. –The maximum price that can be offered at Google Answers is $200 per question. While this can make the service an incredible value, it is also a constraint for larger projects. Of course, you can always post multiple $200 questions, but this is a bit awkward to manage. For a large effort, it’s best to engage a would-be researcher in a bit of dialogue to work out the best arrangement. –And bear in mind that, as good as these researchers are, their real expertise in is in searching…very few of them are actual trained legal professionals. As a final note, suppose you engage Google Answers and are unhappy with the results (it’s rare…but it does happen). The service has a very generous refunds policy…ask, and ye shall receive. Google has launched a new service that could be immensely useful for researchers. You sign in to your Google Account, then install the Google Notebook application (for Firefox it's an extension). You can then select text or images from any page, and a right-click menu option lets you copy that snippet to your notebook. Alternatively, you can keep a notebook window open in your browser and click its “Add note” button. 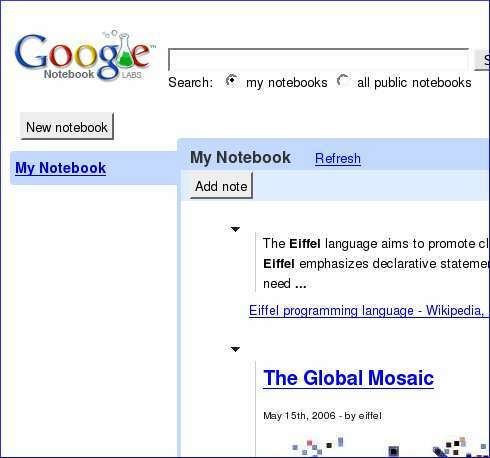 Google Notebook keeps track of the URL from which your snippet came. You can have one or more notebooks, and you can keep them private or tell Google to make them public. You can organise your notes by dragging, and you can add your own text and headings. You can also directly edit the clipped text. Naturally, there's a search box (for your own notebook or for all public notebooks). Whenever you're logged in to Google, the search results will have an added “Note this” link. When clicked, this changes to “Duly noted” and the link (and search result snippet) appear in your notebook. This is a great way to collect information for a research task! How does the mind of a web researcher work? How should you prepare before you research online? First of all, don’t worry if you are not an expert on a subject. In fact you don’t have to know the subject very well to perform good research. Let us start with this premise since this is one of the most important lessons I learned as time went by. The web is a very vast repository of knowledge that it is hard not to find anything on something that has been discussed before. If ever you will be asked something that is not very familiar to you, read on the very basics first. If you don’t know what a usb drive is then to know its basic definitions first. If you need to go to a kids website to understand it then do it. There is no shame in that since it’s your own PC anyway. After that know its history so you could appreciate the trends you will find out later. After getting a good historical perspective, we can now find new articles about the topic. Again treat this on a case to case basis. Usually for technology related subjects, an article done one to two years ago will still be good but the more recent the better. If you’re looking for trends as to social issues like “parent teen relationships” then even a seven to ten year span can be acceptable. Next time we will discuss what your mindset should be when you use search engines. Forgotten or unknown to many young internet users is a historical part of the web, the usenet. Before the graphic oriented browsers and usage of html became common messages and discussions were led in the usenet. Google offers access to about 800 million messages dating back to the early 80’s, some funny and interesting examples can be found here. The whole archive of the usenet is reachable via the google groups. From my discussions with fellow grad-students and students, I have noticed that Google Scholar is not so well known as it should be. Scholar is not so new, and is a wonderful tool for anyone looking for “serious” academic references for their work. Scholar scans academic databases in several languages; and then lists the results. The “regular” Google Index indexes and ranks pages according to their “PageRank” (and basically, although the formula is much more complex, according to links popularity). Scholar ranks the results according to the academic equivalent of link-popularity (or backlinks), which is the “back citations” (or the number of citations of this source in other sources). Since it could be agreed that generally, in the academic world, if you are more widely cited, you are more important; this is very useful. Not only that, but you can browse through the articles that have cited your source, and might find further resources for your research. Scholar is supposed to solve one painful problem when searching for serious information on the web: the huge quantities of rubbish, unsubstantiated information and plain lies. It doesn’t solve the problem. Not entirely. First of all, because one can also write academic rubbish. In addition, with the haste of widening the scope of Scholar, Google have inserted some sources that are more magazine commentary type than academic stuff. But one should always apply a critical analysis of the text one reads, right? Scholar results also include some academic databases where an article could be found, or – in the case of books – a reference to the Google Print version of a book. But this is only the beginning. Its advanced features include things that are even neater. Library Link: Any library can add itself to the Scholar database. If your library is part of the programme (mine, unfortunately, isn’t), you can see if the book/journal is available at the library. You can import the bibliographic details to one of several footnoting softwares, like EndNote. You can search articles by author, or by the journal. You can limit the years of publication. Now, no more excuses for not writing my dissertation, right?